A very important part of our diocesan pilgrimage to Lourdes is our Youth Section and in recent years we have had over 170 young people from all parts of the diocese coming to Lourdes for a week of hard work, prayer and great fun. 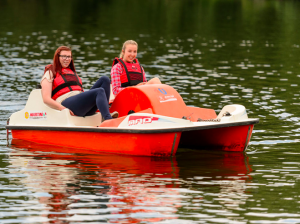 Our Youth Section is open for all young people aged 16 – 25 years. PLEASE NOTE: Due to legal reasons, the young person MUST be 16 years old on the day of travel to Lourdes. Those who join our Youth Section commit themselves to working for a week in Lourdes with all the other members of the youth Section and all the other registered helpers, nurses and doctors. Their responsibility is to offer help and assistance to our diocesan sick pilgrims and to anyone else in the hotels from our diocesan pilgrimage that needs outreach. This is all done however under guidance and supervision and no-one is ever left on their own wondering what to do or how to do it. While in Lourdes our young people are split into four or five teams with some of the adult helpers and nurses also in their teams, so that when each team is on duty for work in the Accueil or with our sick pilgrims there is a mix of people of all ages, new helpers and pilgrimage experience. No-one will ever be expected to do something they feel uncomfortable doing, but what you do throughout the week will stay with you for a long time and in some instances affect your whole life. You might even want to come back for another pilgrimage!! There is work to do in the Accueil Marie St Frai – cleaning the ward and the bedrooms, cleaning the bathrooms and showers, helping some of our assisted pilgrims to get dressed, helping with making sure tea and coffee is offered to our pilgrims, sometimes helping one or two of our pilgrims with their meals in the dining room. Our Young people also do a lot of pushing of wheelchairs so that we can take our pilgrims to mass or to a Pilgrimage Service in the Sanctuary, or to another event. A trip to some of the shops is a must for our pilgrims and so the help of our young people here is invaluable. Sometimes, this trip might also include a stop or two at a local bar or café for a coffee or soft drink, or perhaps even a small beer! During the week in Lourdes we take our pilgrims to different places to Mass, there might be a trip to the Lac de Lourdes or to the Cite St Pierre and we ask all our young people to help here as well, especially if we decide to have a picnic lunch at one of these places. The pushing of wheelchairs for a visit to the Grotto is an important part of a pilgrims week in Lourdes and so there might be a few quiet moments there as well as the processions, two great celebrations held every day. At the end of a busy day, our young people gather with the priest leader and adult helpers, an the bishop, for prayer and reflection on what it means to be a catholic Christian today, and is often led by some of the young people themselves who give witness and testimony of their own faith journey. To try to keep the costs a little lower for our young people, travel to Lourdes is by express coach, ie it travels directly from the Diocese straight to Lourdes, travelling overnight, arriving in Lourdes about 28-30 hours after leaving. The accommodation for our young people is in the Hotel Alba, which is a 4* hotel in Lourdes and we expect our young people to be prepared to share a room with up to three other people for the week in Lourdes. Booking Forms are usually available from January of each year of travel. This is a link to the pdf of the Youth Booking Form. Youth Booking Form 2019 A4 version If you are printing this off there should be 8 pages. Please make sure that you print them all before you send them to the office.